I enjoyed my guest hosting duties on the radio today and wanted to follow-up on a question from a caller. The caller wanted to know how many people were currently working and paying into Social Security and if the number were lower than in the past and, as a result, causing some of the financial woes for the program. Actually the number of workers paying in right now is the highest it has been, but what I told the caller to pay attention to was the number or workers per retiree, or beneficiary. The OASDI trustees report (available here) gives all this information, but I boiled it down to a simple graph. The decline in workers per retiree is large and persistent. For a project in my graduate school demography I estimated Social Security would start to have issues with payouts versus revenues in 2013, so I was off by a few years. My error was not assuming a major financial crisis in 2008. I know, how could I miss that? 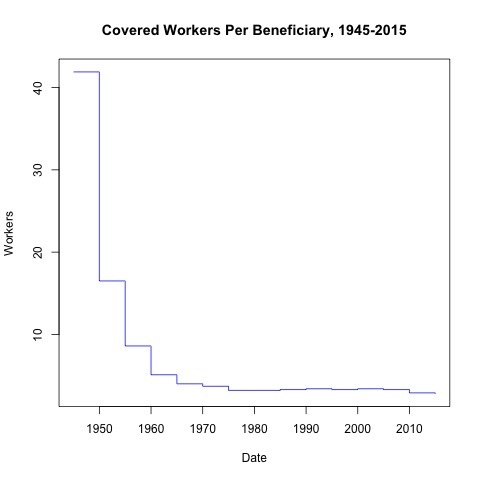 Anyway, there were other calls about Social security some more posts about the demographics of America and implications for pensions seem to be in order so expect those soon.